Start-ups in the augmented, mixed and virtual reality spaces are building real businesses. 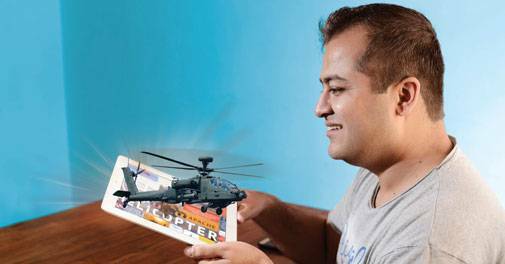 For Rajiv Srivatsa, Co-founder and COO of Urban Ladder (UL), one of India's most well funded online furniture start-ups with backing from the likes of Sequoia and Ratan Tata, the challenge was real. How do you convince people to buy furniture online? While measurements of a sofa or a rocker or a chest of drawers could be put online, prospective customers couldn't decide whether it would fit in a particular space in their home or whether the colour of the furniture would match their dÃ©cor based on a two-dimensional static image on a website. UL felt that unless they cracked this puzzle, sales would always be affected. So Srivatsa, who leads the technical end of the company, decided that they ought to provide prospective customers with an immersive, lifelike experience of how the furniture would look in their home. So the nascent UL Labs, working collaboratively with a few other digital start-ups, came up with an 'augumented' reality app called 'Living Spaces'. The app enabled users to virtually place any life-size model of a UL furniture piece - it would project the furniture with the help of the camera of the device (a phone or tablet) and indicate how much space it would occupy. The app made the interactions natural, with the customer having the ability to change colour and seating options. 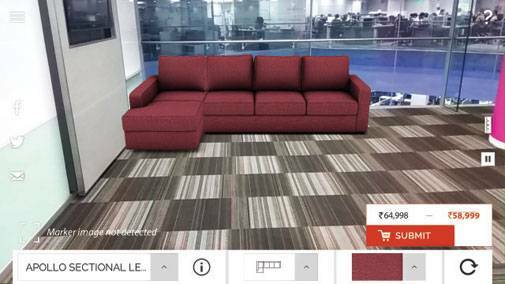 Swathi Nanjappa, who has bought a sofa set from UL, says it was the app that helped make up her mind. "Otherwise I would have had to spend countless hours trying to visit multiple sellers. With this on my iPhone, I was able to zero-in on exactly what I wanted." Srivatsa says the app was developed with basic marker and rendering technology. "We are still in the early days of Augumented Reality (AR) and the possibilities are endless. Remember we are seeing the impact of smartphone explosion only now. So AR's real impact might be three-four years ahead when it becomes more mature and accessible." From the immensely popular game Pokemon Go to people experiencing the thrill of a roller coaster ride firmly ensconced in their lounge chair, augmented reality (AR) and virtual reality (VR) have become the next big thing in technology. While terms like AR, VR and MR (mixed reality) are almost used interchangeably there are minor differences between them. In augmented reality, things are superimposed on the current environment, while virtual reality cuts you from your surroundings and takes you into a new virtual world. Mixed or hybrid reality as the name suggests is more of a merging of real and virtual worlds where physical and digital objects co-exist and interact. Most of the attention has till now been on physical hardware (think headsets, motion controllers, etc) - from the likes of Occulus Rift (Facebook), Google Cardboard, Samsung VR Gear, HTC Vive, Microsoft Hololens, Sony Playstation VR and countless others - which allows one to experience these new technologies. Prices of these headsets vary from as low as a few hundred rupees to several thousand. While there are a few players that offer India-made hardware, most local start-ups have focused on providing content, experiences and services for the AR/VR/MR market. The reason? Services and content require less capital, and represent a larger opportunity. Like the IT services sector, these start-ups feel that given the amount of affordable and ingenious talent available in the country, India is likely to emerge as a key player in the AR/VR/MR global content and services market. Ever had the experience of waiting near a trial room in an apparel store, loaded with an arm full of clothes waiting for somebody to exit, to use that room? Wait no more. When three IIT Bombay graduates saw apparel stores struggle with this challenge, they decide that they would tackle this problem and setup Shopsense Technologies to offer a virtual dressing room. Harsh Shah, Co-founder of Shopsense, says his company enables the ease of online shopping in stores. 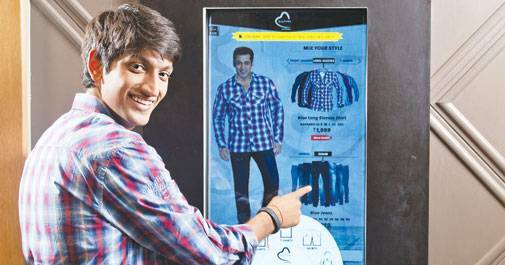 It installs virtual dressing rooms (virtual mirrors) with the entire inventory of the store available on a large touchscreen. With your image being projected on the screen with cameras, the virtual mirror then allows you to try on 'virtually of course' the entire inventory of the shop. "One could mix and match different attire as well as get a friend's opinion on just say a WhatsApp message, for a particular 'look.' One could also check how a particular dress drapes over the projected 3D-CAD image given that the contours of each individual is unique," says Shah. While the Future Group was its first client, Shopsense has subsequently signed on Nike, Satya Paul and US Polo, among several others. "We today work with 140 brands and have 60 employees," says Shah. The company has also attracted investments from the likes of Kae Capital, and Kunal Bahl and Rohit Bansal of Snapdeal fame. Shah says this AR implementation is only the "tip of the iceberg. There are several other opportunities waiting to be exploited". 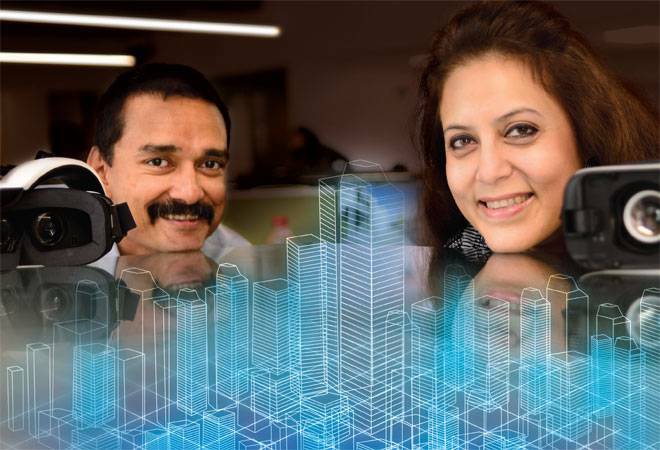 One such opportunity is being exploited by the husband wife duo of Gautam and Tithi Tewari, who run SmartVizX. If you have recently tried to buy/lease a commercial space or a flat from a builder, you would most likely have got a computer walk-through for a sense of how different spaces of the property would look like. For the Tewari couple, who had worked with international design firms for 17 years (Gautam has a masters in construction management from UNSW Australia while wife Tithi has a Bachelor of Architecture from CEPT Ahmedabad), the "static and passive walk-throughs" felt stale. So in February 2015, they decided to start SmartVizX with the objective of offering clients an "interactive immersive VR experience". So, instead of using traditional architectural software like Auto CAD, Maya or 3D Max, the Tewaris say they have developed their own CGI tools and platform. "We have three interim patents on this. What we offer is a productised service allowing us to scale quickly," says Gautam. Impressed with their effort, Indian Angels Network and Stanford Angels and Entrepreneurs India have invested $500,000 in the company. SmartVizX says it is profitable. "We believe in earn before you burn. We have been operational only 15 months and intend to invest in R&D for visualisation tools. The VR tools we have built have applications across industry sectors and not just construction and interior decoration," claims Gautam. Mumbai-headquartered Flipspaces, started in July 2016 by IIT alumni, is in a similar space. Kunal Sharma, Founder and MD of the company, says that it has developed a VR native application to help interior decorators and architects. Within three months of launch, the company says it has done more than a million dollars in revenue. "We didn't even take any funding and were bootstrapped. Clients see value in our VR application," says Sharma. One such client, who says it is happy with what Flipspace has delivered, is WorkAmp, an emerging co-working space provider in Mumbai. Smeet Gala, Founder & CEO of WorkAmp, says, "A general feedback has been that the space is infusing creativity and helping each co-worker to increase their productivity while working from WorkAmp." Does Your Kid's Textbook Have This? Most people would never have heard of the name Ratna Sagar Pvt Ltd. For the denizens of Delhi, they may actually mix-it up with Sagar Ratna, a well known chain of restaurants in that city. However, if you have a kid, there is a high chance that they are using a book published by Ratna Sagar. This is because the company is one of India's largest textbook publishers. As a part of value-added content, Ratna Sagar would provide a CD along with the printed textbook. In the era of smartphones when CD drives are redundant, increasingly the publisher realised that an expensive and useful aid to the textbook was hardly being used. That is when Gaurav Wadhwa, Co-founder of Gamooz, met the publisher and explained how an MR app could help. When a kid has studied a chapter, all he needs is to scan that chapter with the camera of a smartphone using Rebook, an app of Gamooz (available both on iOS and Android). It immediately provides for video, audio and animated content relevant to that chapter using mixed reality. Wadhwa, an Infosys and SAP veteran, says he stumbled into the virtual reality world while experimenting with various technologies. It is not just Ratna Sagar who works with Gamooz. Oxford University Press (OUP), one of the renowned publishers, has got 105 books embedded with this MR technology. "It is not just publishers. We have worked with Ford on campaigns for Fiesta, Ecosport and a few other auto models of theirs. Also we have other clients like Tech Mahindra, Saudi Telecom, a leading Mexican publisher and a few others we cannot name," says Wadhwa, who is gung-ho about India's prospects in the AR/VR/MR field. "It is about content, creativity and scale, all of which we excel in," he adds. Yet another such content player is a VR studio, called SpectraVR, run by Sushant Baliga. Spectra VR has created virtual reality experiences for diverse clients like Kingfisher (beer and part of United Breweries, not the defunct airlines), Standard Chartered, Wonderla Holiday Resorts, Mercedes-Benz and several others. "Virtual Reality opens up new territory for brands as it puts the viewer at the centre of an experience," says Samar Singh Sheikhawat, Senior Vice President, Marketing at United Breweries. Sheikhawat agrees that VR is nascent and still evolving, so it's too early to start comparing the effectiveness of the medium vis-Ã¡-vis traditional advertising media. "It's a new form of storytelling and VR could be transformative for the ad industry going ahead," he says. Spectra VR says it is working with nearly 40 brands on various VR campaigns. Baliga says in VR content - which is a mix of animation, VFX (special effects) and liveshoot - India has an edge because of its cost effectiveness and creativity involved. "I believe that in the future this segment can really be very large." Others like Lenskart (an online retailer of eyewear) have a VR app to see how a pair of glasses looks on you while Commonfloor(now a part of Quikr), a real estate portal, also offers a VR experience. Even as VR hardware becomes mainstream, it is becoming clear that India could emerge as a major player in providing content and services using this new technology.